Hiking takes preparation. However, even the most prepared walker will find themselves carrying their coat or jacket for at least part of the walk. 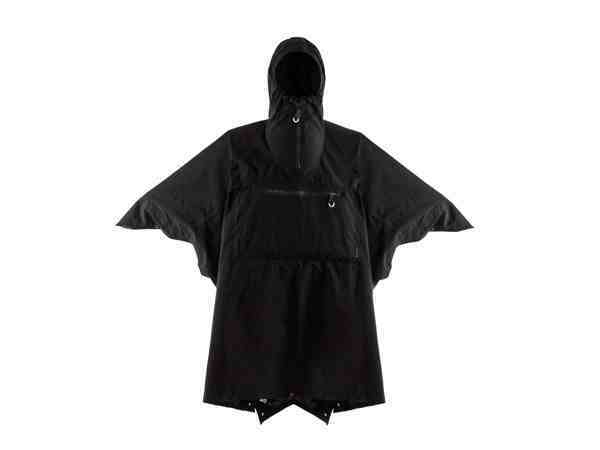 To the rescue comes the Vamoose Cherrapinji, a poncho that folds up into a rucksack for easy storage. The Vamoose Cherrapinji is a kind of hi-tech version of a wax jacket in looks; it uses eVent fabric that’s much lighter as well as being completely windproof and waterproof, while also being breathable. In practice, it doesn’t leave you all sweaty during rain showers in summer, while the rucksack it folds and let into is comfy to wear and professionally constructed. The straps and zips used to make it into the rucksack or live in a front pocket when the poncho is unfurled. There’s an inside and outside pouch at chest height that uses waterproof Aquaguard zips. Although this is a fabulously made product (and in the UK, no less), we’re not convinced it’s suitable for serious hikers purely because there are probably going to already have a rucksack strapped to their back. However, the Vamoose Cherrapinji would be utterly perfect at a festival or any outdoor event. That said, if you’re planning to do any hiking involving porters – such as Peru’s Inca Trail – the Vamoose Cherrapinji would work a treat in the cloud forests of the Andes and beyond.